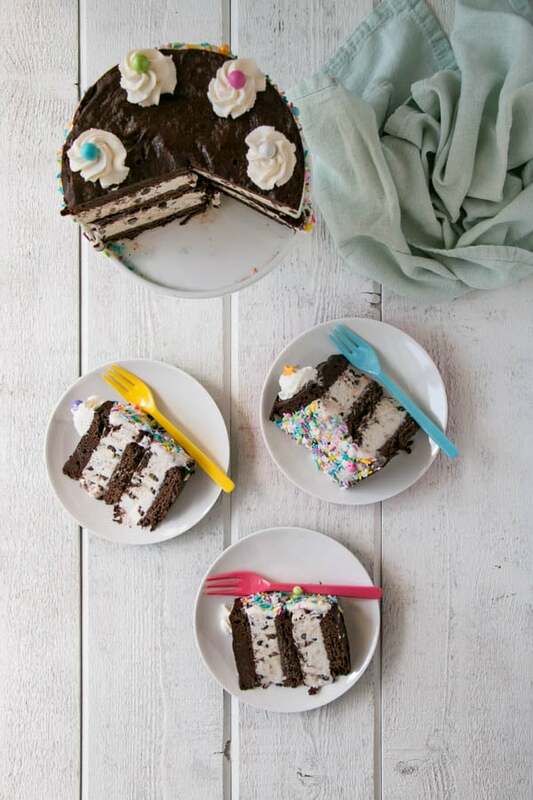 This Ice Cream Sandwich Cake has thin layers of brownie cookie with thick chocolate chip ice cream layers. Topped with whipped cream and extra sprinkles! OMG, it’s finally here. The Ice Cream Cake that I’ve been dying to share with you all is finally complete! It took a few attempts, but I’m happy with the end result. What do you think? Would you jump right in and snag a giant slice? I had originally come up with this idea some time ago and was chatting with my cake blogging friend Olivia about it. I was having a difficult time finding a reliable recipe that had a soft chocolate cookie suitable for an ice cream sandwich. After many options we figured out that Olivia’s Brownie Cookies would be perfect! I took the recipe and baked it up in 3 cake pans (with a couple of adaptations) and layered in some ice cream to complete the cake. The first time I made this cake it was for my twins 4th birthday party. They loved it. 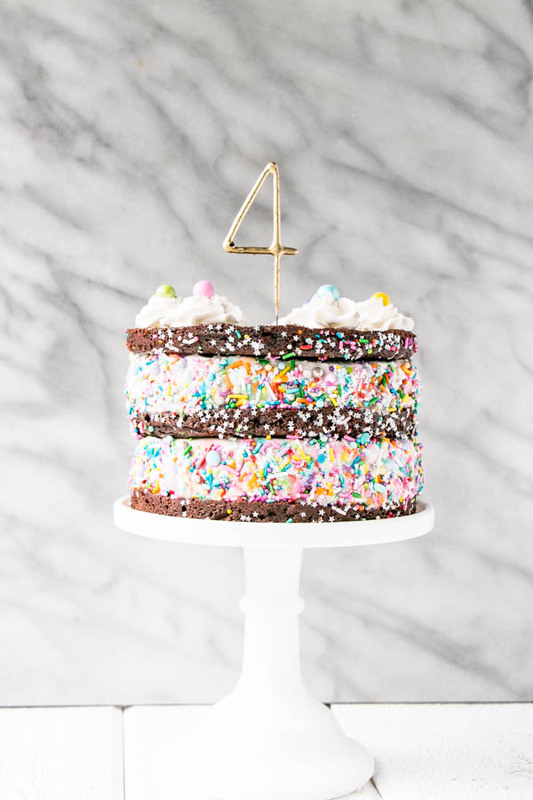 There’s so many sprinkles on it that I doubt any 4 year old would dislike this cake. I’m so clumsy that I dropped one of the cake layers and had to stuff it into the middle of the cake so that no one would know what a disaster I am. This cake looks impressive on a cake stand, but I’d recommend taking it off the stand to cut it. And run hot water over your knife before hand as well to make slicing through the ice cream easier. Preheat oven to 350° F. Line three 6" round cake pans with parchment paper (cut to size) and spray pans with non-stick spray. Melt chocolate and butter in a large sauce pan over low heat until chocolate is almost completely melted. Remove from heat and whisk until chocolate fully dissolves. In a small bowl, whisk together sugar and eggs. Add to chocolate in sauce pan and whisk until completely combined. Add flour and baking powder and whisk until combined. Divide batter amongst 3 cake pans (either eyeballing it or using a kitchen scale) and gentle tap on the counter to release any air bubbles. Bake for approximately 13-15 mins, until cookie cakes are cooked on the edges but still soft in the center. Cool in cake pans for about 20 minutes and then carefully remove cookie cakes and cool completely on a rack. Once cool, place in an airtight container with parchment or wax paper between cakes. Place in freezer (will keep for 2-3 weeks in freezer). With the paddle attachment on, beat ice cream in a stand mixer until softened. Add chocolate chips and mix until combined. Line two 6" cake pans with plastic wrap with lots of overhang and divide ice cream between each pan. Smooth out top and push ice cream out to the sides as far as possible to create a smooth surface on the sides and top). Wrap plastic wrap over the top to seal. To assemble, whip whipping cream until soft peaks form. Add sugar and vanilla and continue to whip until stiff peaks form. Places in a wide star tipped pipping bag. 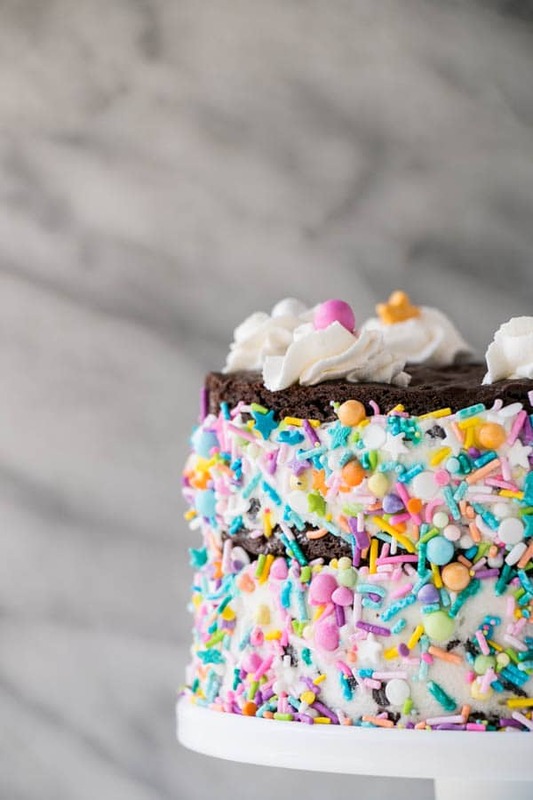 Remove ice cream from plastic wrap and layer in-between cake layers. Top with a 5-6 whip cream circles and sprinkles. 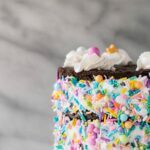 Using one hand pat sprinkles around the ice cream layers of the cake. Return to freezer to firm up for 1-4 hours. * I used Sweetapolita Sprinkles, but these are a close match. 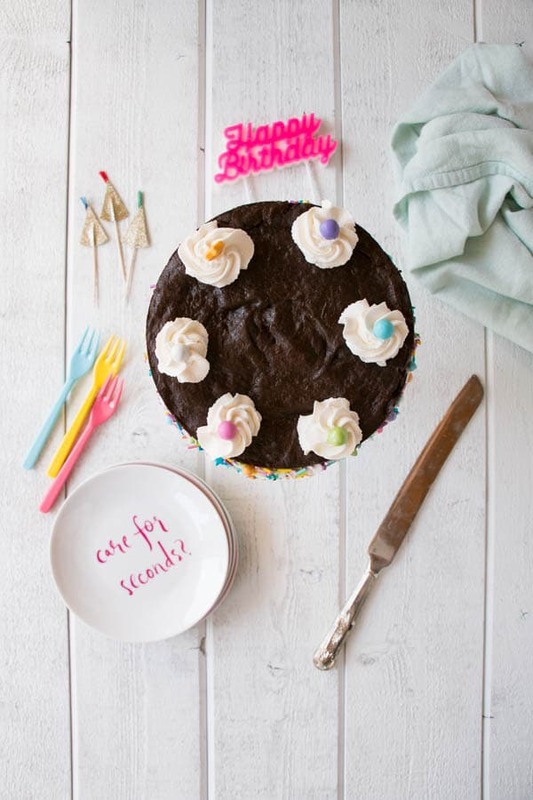 Brownie Cookie Cake Recipes is adapted from Liv for Cake’s Brownie Cookies. Sprinkles fix everything! Such a beautiful cake, thanks for sharing! I agree Charlotte! Sprinkles make me smile just looking at them. Thanks for your kind words.